They Remembered Me, this Norman Rockwell painting, appeared on the cover of Leslie's published December 22, 1917. Alternate titles for this illustration are Private Sammy Smith or Soldier with Care Package. This was the fourth cover by Rockwell to appear on Leslie's and the third of three in 1917. 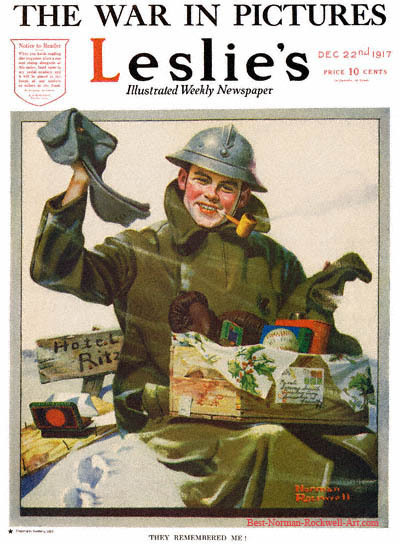 Only six Rockwell covers were published by Leslie's from 1916 to 1919. Rockwell only submitted to this smaller magazine after the bigger publishers had declined to publish the cover illustration. Rockwell's preference and his first choice of publication was The Saturday Evening Post. He believed, and his career showed, that the cover of the Post was America's biggest showcase window for artists. This soldier, Private Sammie Smith according to the shipping label, has just opened a "care package" from home. He is ecstatic. Not only did folks back home remember him, they remembered him well enough to send Christmas gifts. He has pried open his crate to reveal an assortment of useful and practical presents. Its a good thing he's a man! A man at war values practical gifts above all, only the sentiment matters more. Looking inside the crate, we see a baseball, a pair of boxing gloves, two books, cigarettes and a tin of pipe tobacco. We do not know whether or not the tobacco pipe in his teeth was part of the package. I suspect that it was. By and far, the gifts he is most excited about are the socks and scarf. He will still not be warm, but he will at least be less cold. New, clean, warm socks are indeed a blessing when your feet are cold. Looking at this painting makes me feel cold outside, but warm inside .